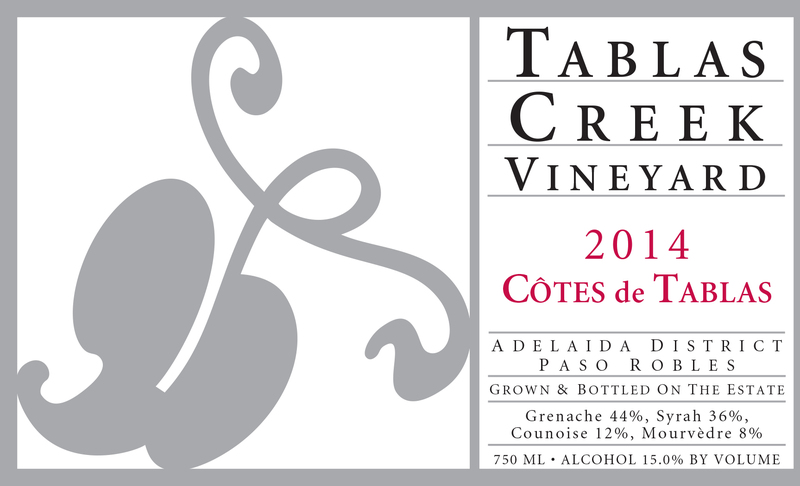 The 2014 Côtes de Tablas shows a deep, spicy nose: new leather and blackcurrant and licorice and a sweet spiciness like a clove-studded orange, all held in check by a persistent minerality. The mouth is generous with chocolate-covered cherry and a minty, juniper note. Beautiful chalky tannins come out on the long finish, with lingering licorice, mint, and saline mineral notes. Drink now and over the next decade-plus. The 2014 vintage was our third consecutive drought year and saw our earliest-ever beginning to the growing season. The summer was warm but without serious heat spikes, and our coolest August in a decade slowed ripening at a critical period. When it warmed back up in September, the fruit tumbled in, and we finished in mid-October, about two weeks earlier than normal. The result was a vintage with excellent concentration balanced by good freshness, which should be vibrant and powerful young, but with the balance to age. Syrah harvest began September 5th followed by Grenache on the10th, Counoise on the 11th and Mourvedre on the 12th. All varietals were fermented in a mix of stainless steel and wooden upright fermenters with the use of native yeasts. After pressing, the wines were racked, blended, aged for a year in 1200-gallon French oak foudres, and then bottled in February 2016. The wine is unfined and underwent only a light filtration before bottling.